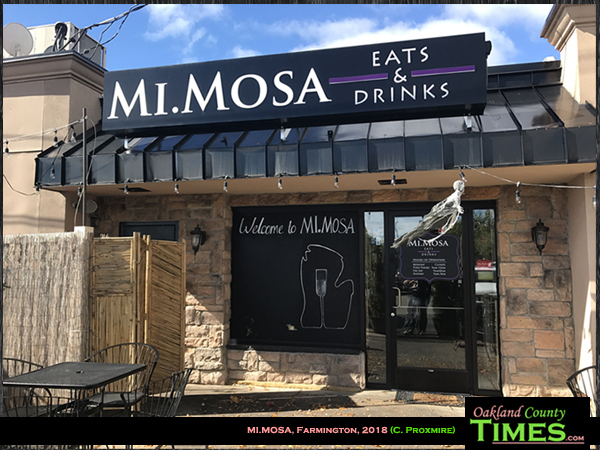 Farmington, MI – Several readers recommended MI.MOSA in Downtown Farmington, and it did not disappoint. Apparently it’s busy on the weekends, but mid-week lunch was a great time to claim a table and get some work done while enjoying a feast of flavors. The name is a clue as to their most popular drink. I had the blushing mimosa, though there are a few different varieties available. 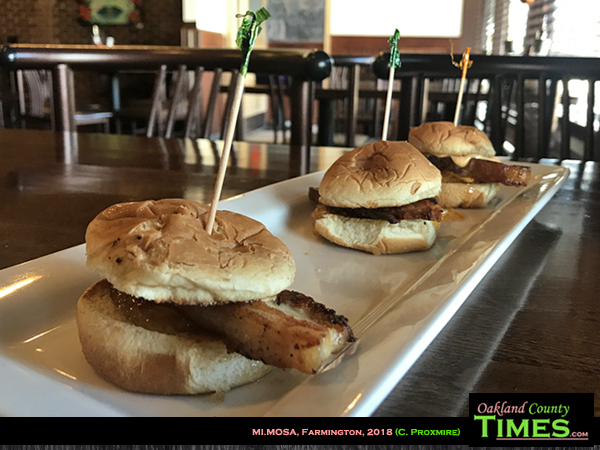 For lunch I ordered the Pork Belly Sliders with Orange Marmalade and Sriracha Aioli and the Brussels Sprouts. I was amazed at how well the toppings went together along with the pork belly. 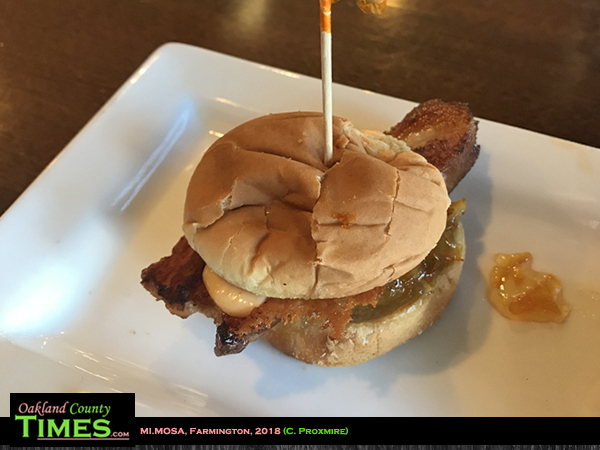 The greasiness of the meat was cut by the tang of the sauce and the sweetness of the marmalade to make a very impressive little slider. Well, three sliders, actually. So it was definitely filling. 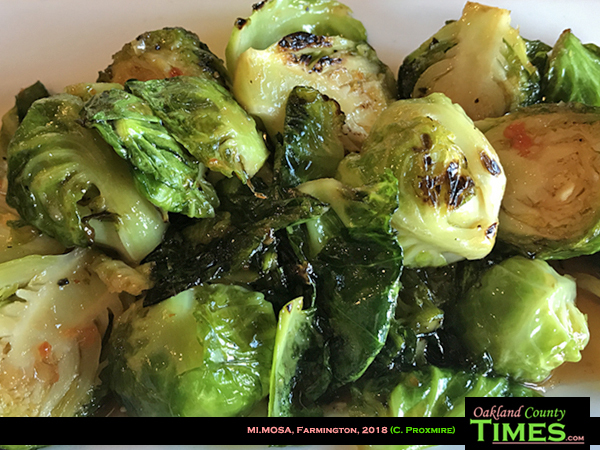 The Brussels Sprouts were sautéed in a sweet chili sauce and served in an abundant portion. The space itself has a cute artsy vibe, with paintings for sale on the walls by local artists. When I was there they were playing mellowed down versions of popular songs, which I think gave the whole experience a more leisurely feel. 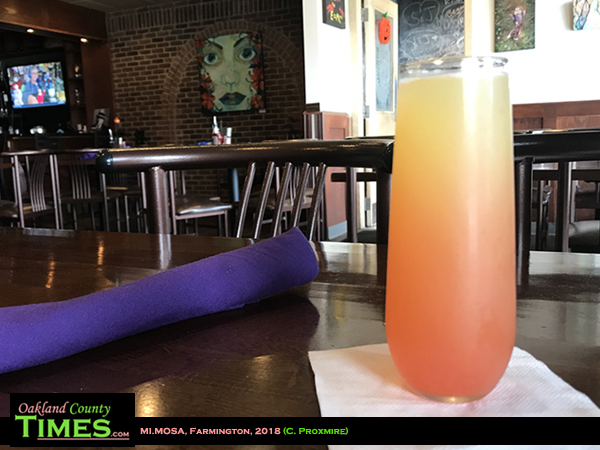 This was food worth eating slowly and savoring, and mimosas are made for casual sipping. All and all a relaxing, delicious lunch.